Demon's Crystals is a frenetic twin stick shooter where you guide the Urican demons through countless hazards in order to restore peace to the world. Demon's Crystals is a frenetic twin stick shooter where you guide the Urican demons through countless hazards in order to restore peace to the world. A variety of weapons and power-ups will help you defeat the massive enemy hordes. The Urican have always been at the top of the food pyramid, but one day three mysterious beings arrived causing the once peaceful inhabitants of the world to become aggressive and destructive. Arcade, 1-4 players: This is a coop mode that can be played by up to four players, with the goal of completing the three worlds and defeating the final bosses. Characters have a leveling system that will affect their endurance and strength. Survival, 1 player: You will have to survive as long as possible. You will be able to compete against other players around the world thanks to the online rankings. 6 local multiplayer game modes, 2 to 4 players: Survival, Deathmatch, Vs, Crystal Attack, Capture the Great Crystal, and Kill the Enemies. 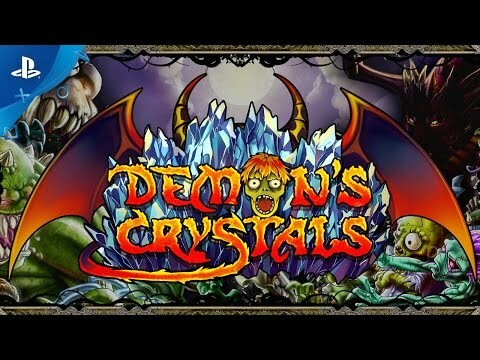 Demon’s Crystals ©2016 Byte4Games. Published by Badland Games. Developed by StarCruiser Studio. All rights reserved.